We made a quick meal last night of smoothies with plain yogurt, blueberries, peaches, pineapple, carrots, Amazing Grass and apple juice, so we could continue making the place ready. Elizabeth even got in on the action by gathering daisies from the horse pasture behind us. Have fun with family this weekend. 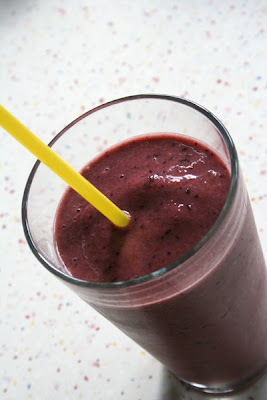 Smoothies for dinner sounds perfect for this time of year-who has time to cook?! Have a fun packed weekend! Do you have a special banner you set out when guests come? Love that orange thing. what is it? Have a wonderful weekend. 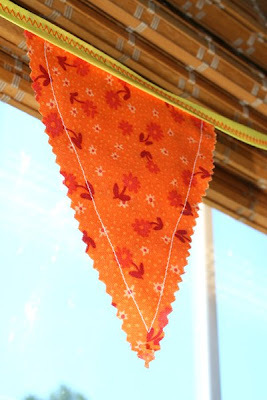 I love the fabric you used for your banner...orange is such a happy color! Have a great Memorial Day weekend as a family! Have a great weekend Joy. The Smoothy looks so yummy, my girls are smoothy addicts! 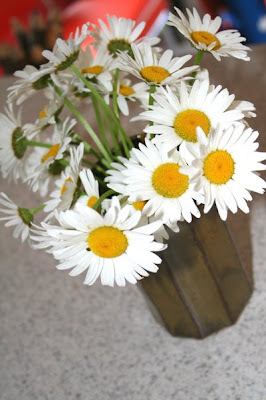 Love the wild daisies.